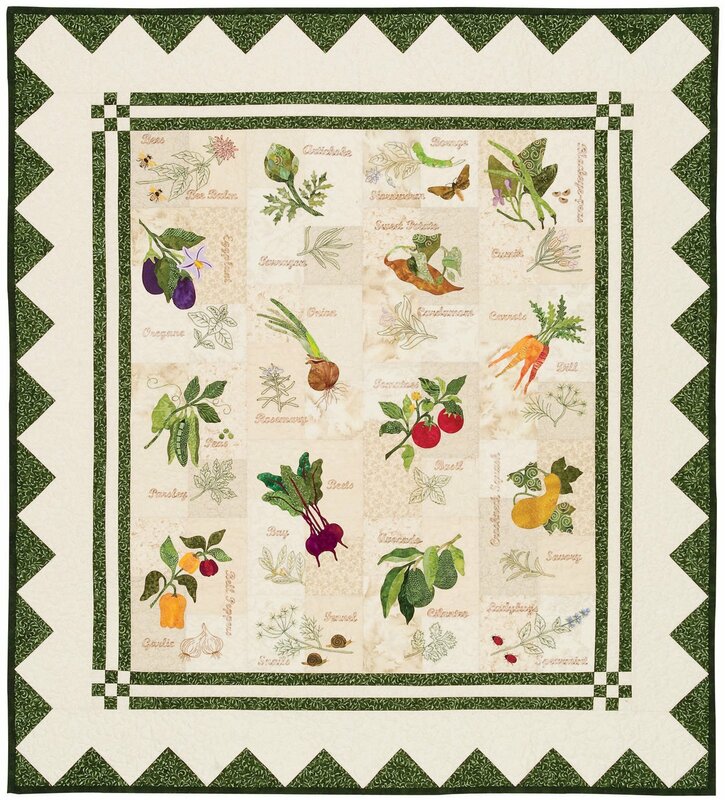 Pearls Garden Quilt is a bountiful harvest of vegetable and herbs. The background blocks are pieced in an offset setting with squares and rectangles. There are twelve 9" x 12" vegetable and herb blocks and, for a bit of whimsy, four smaller 6" x 9" herb and insect blocks. Each of the large blocks combine applique vegetable, embroidery herb, and inked lettering. The smaller blocks have applique insects, embroidery herb, and inked lettering. The quilt is assembled in vertical rows giving it a surprising diagonal setting. The pattern has full size pattern layout for the applique blocks and easy to follow hand applique and piecing and inking directions. Finished size 54" x 60".